I love birds. Their cheerful chirping and singing while they flit around the trees and eat the bugs in my garden just fills my heart with happiness. So this week's theme at SUO Challenges also fills my heart with happiness, because it's for the birds. No, really....that's the theme! The new Stampin' Up! annual catalog is filled with stamps, punches and dies that feature birds, so why not create something featuring our feathered friends and show it off for us to see? Some of my favorite birds are hummingbirds. They're like tiny flying jewels, but with an attitude. They can be very territorial around "their" feeders! 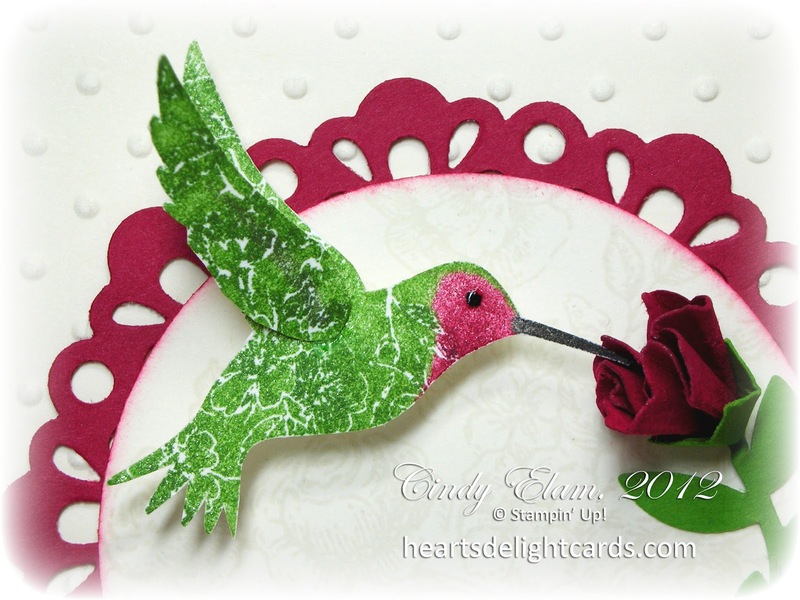 The male ruby throated hummingbirds are particularly showy, with their iridescent green backs and wings, and deep red throats, so I tried to capture their loveliness with this card. The image was stamped on Shimmery White cardstock to try to imitate the iridescence, and a tiny drop of Crystal Effects made his eye nice and shiny. WOW! I am so impressed! This card is beautiful! 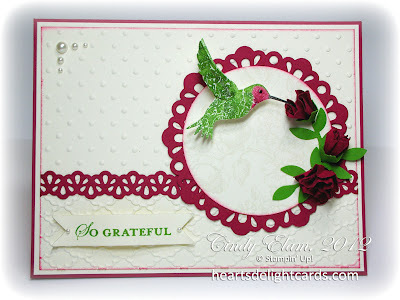 How did you make the beautiful rosebuds on this Gorgeous card? I love the shimmery hummingbird,too! Absolutely stunning! Stunning, Cindy! You put the Big Shot to work on this one. What a stunning card! There are details everywhere, but it's not too busy or over-done. PLEASE share with me how you made the flowers. Is it safe to assume you created them using the boho blossoms punch?! Ooooh, total gorgeousness! All the little details on this card are AMAZING! Gorgeous with his iridescence! Just gorgeous!